The latest of China’s most advanced guided missile destroyers will likely show up in the South China Sea. China has added another of its most advanced destroyers to the South Sea fleet, according to China Military Online. The guided missile destroyer Hefei (hull number 174), the third in the Type 052D class (also known as the Luyang-III class), was commissioned in a ceremony on Sunday at the naval port at Sanya, in China’s Hainan province. As The Diplomat repeated previously, the first two Type 052Ds were commissioned in March 2014 (the Kunming) and August 2015 (the Changsha). Like the Hefei, those two ships were also deployed as part of China’s South Sea fleet, which operates in the South China Sea, where China has maritime disputes with Brunei, Malaysia, the Philippines, and Vietnam. 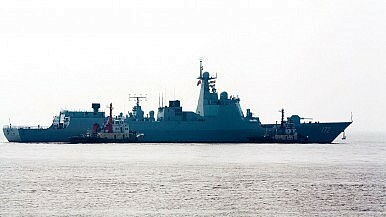 The PLAN has plans to add an additional nine Type 052Ds, for a total of 12. Construction has been completed on seven. The People’s Liberation Army Navy’s annual South China Sea combat drill kicked off this Wednesday.